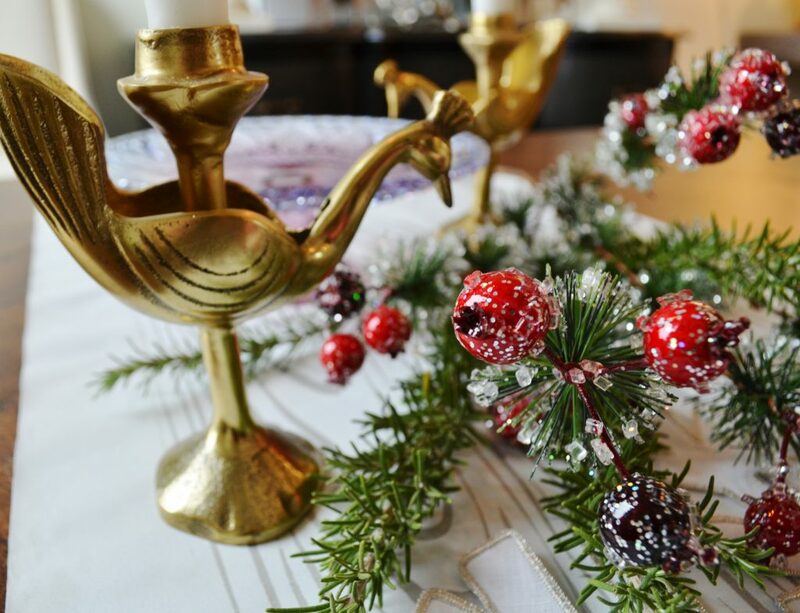 Creating a stylish tablescape is an easy way to make your home look festive and holiday ready for you and your guests. A beautiful tablescape can be simple to put together. 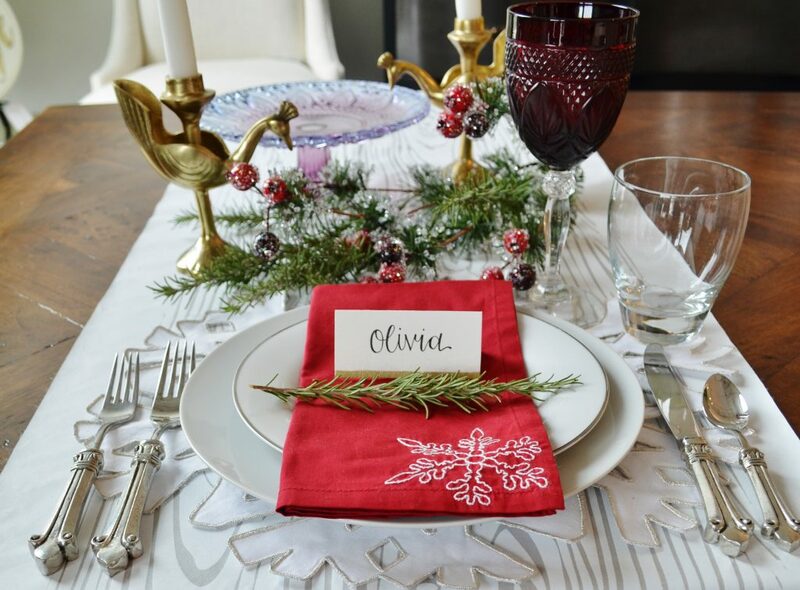 In today’s How-To, we will show you how you can create an effortless and chic holiday table setting in 5 easy steps. Table linens dress up a table setting and can offer something truly unique to your tablescape. You can cover the entire table or jazz up the table with a printed runner. This is also your opportunity to set a color scheme. 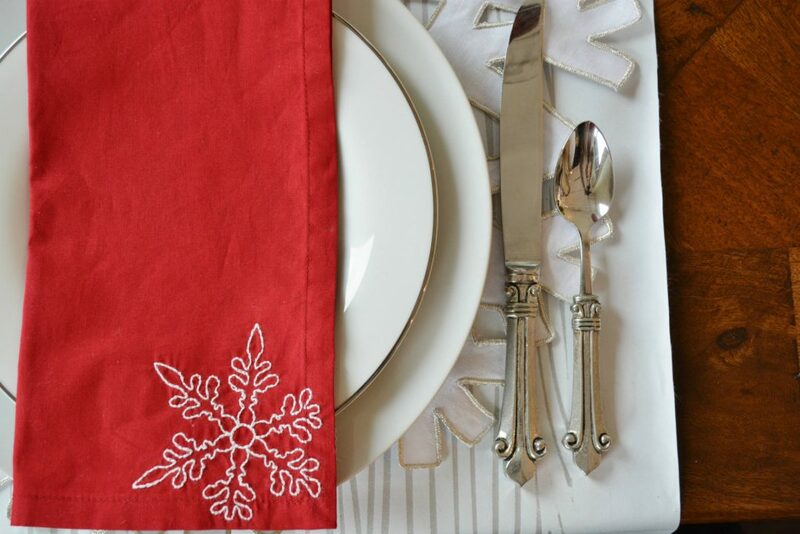 We used a white linen runner with a metallic silver faux bois printed pattern, a crisp snowflake placemat, and a bright red napkin with a embroidered snowflake. 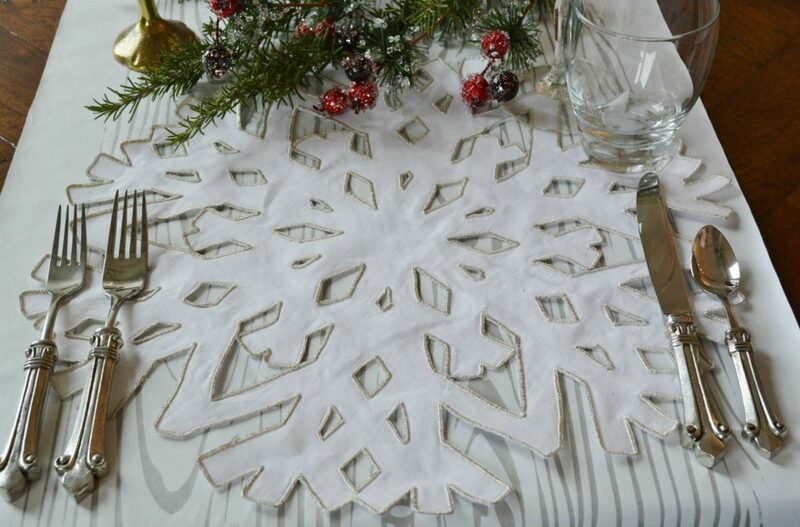 It is a lovely base for our holiday table setting. You do not need a full set of china to make a table beautiful and elegant. For this step, take a note from the Parisian handbook and mix and match your tableware. In other words, take inventory of what you have and use it. This will create a look that is effortless and chic. For our tablescape, we stacked simple white plates in varying sizes. We added sparkle and color with our stemware. 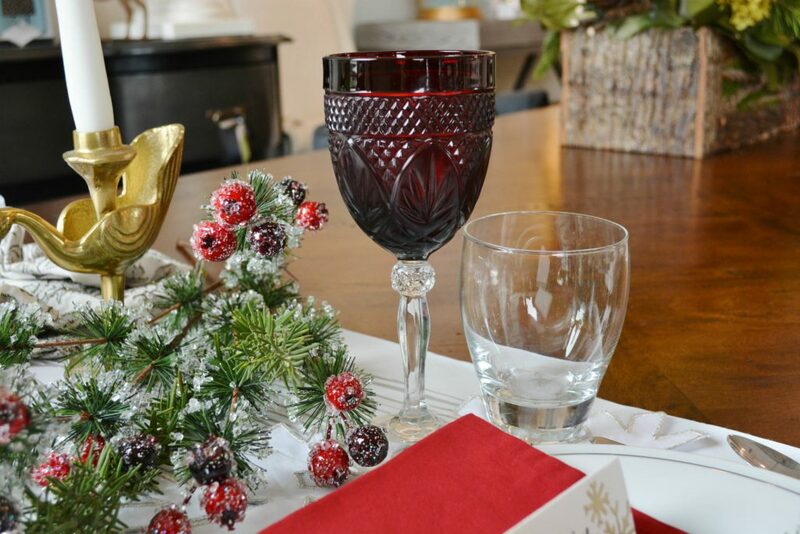 Our vintage ruby red stemmed glasses add a pop of color when paired with our neutral linens and plates. 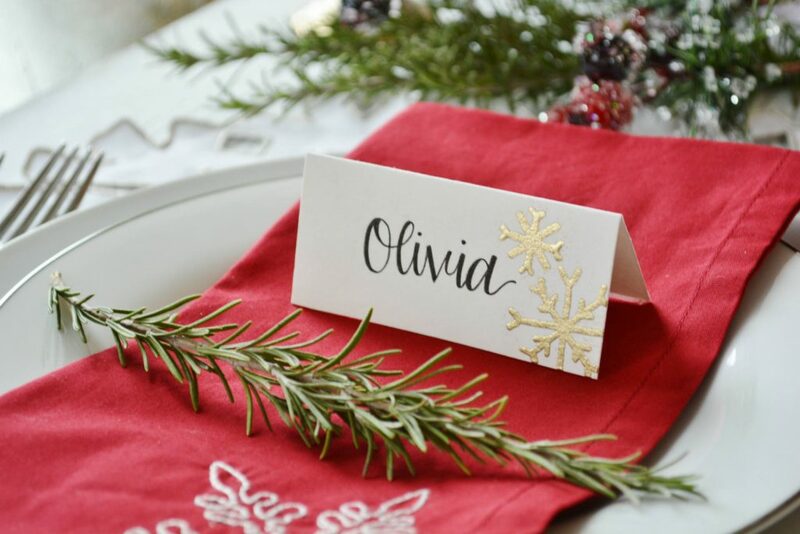 Place cards add a personal and inviting touch to a place setting. 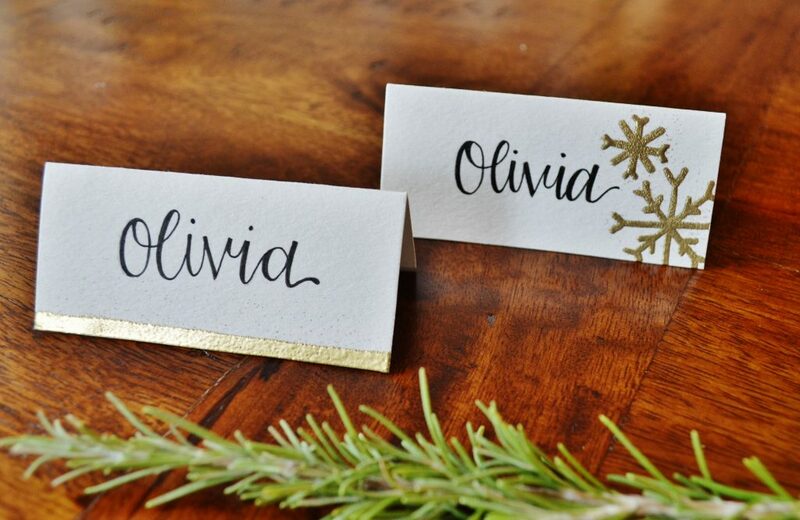 Place cards are something you can easily D-I-Y. For our place cards, we used cardstock, an embosser and a rosemary sprig. You can just add a touch of metallic to the bottom of the card as shown or get creative and stencil on a snowflake. We added a sprig to our place card, which can be found in your very own backyard. It is a such an easy idea, that adds a a great statement to a table. Rosemary, pine, or olive branches are some of our favorites. Click here for our Downloadable Gold Place Cards, add your guests’ name, and you instantly have a personalized card to add to your napkin. For an even simpler option, click here for our Downloadable Christmas Tags. These handmade gems make the cutest gift tags or place cards. It is a thoughtful take-away for your guests. Now that your place setting is complete, don’t forget the greenery. 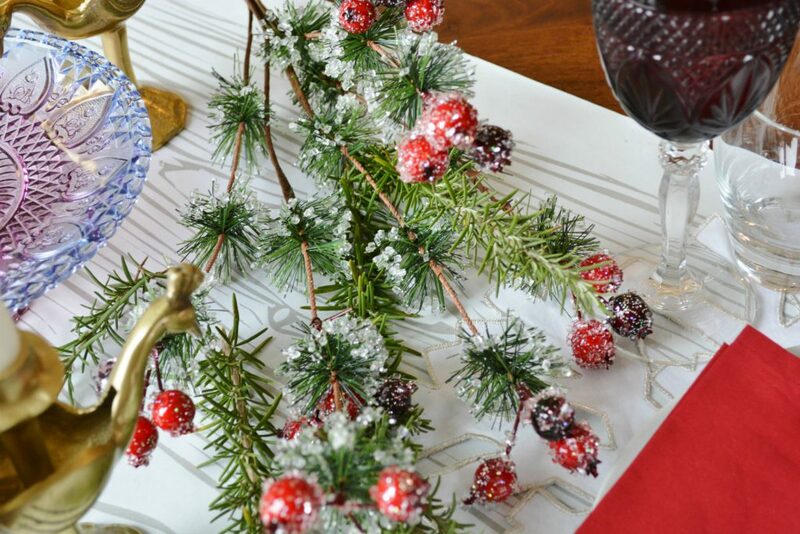 Floral arrangements, garland, and spray are key to bringing your holiday table setting to life. Add a mix of styles to the center of your table to fill the table that way the decor can be appreciated by each guest at the table. We used a pine and berry spray that can be purchased at our store and mixed in a handful of rosemary to fill in the space. Finally, the perfect table setting incorporates different light sources. Do not only rely on the light from sconces, lamps or chandeliers. Be sure to add some candlelight to your table! The soft light from votives and candlesticks will add a lovely glow and warmth to the table. 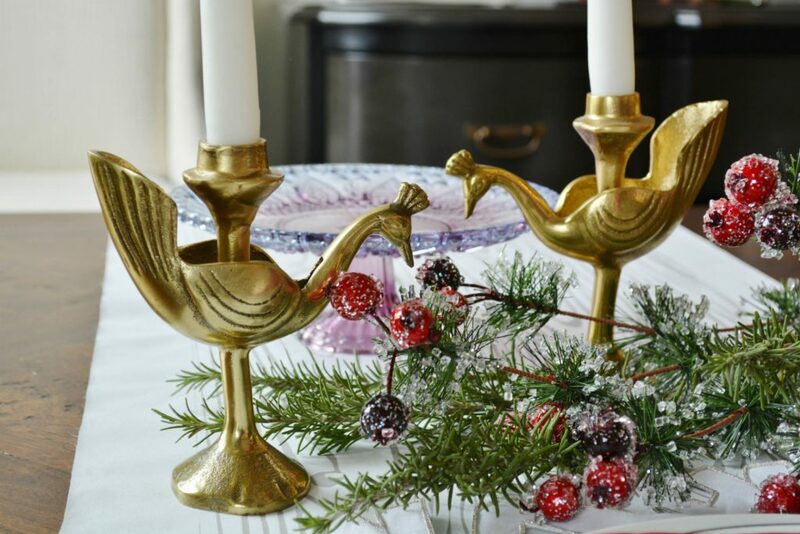 We used festive brass peacocks for a dash of whimsy to our tablescape. Tip: Always choose unscented candles. They will allow your culinary treats to be the star of the table. 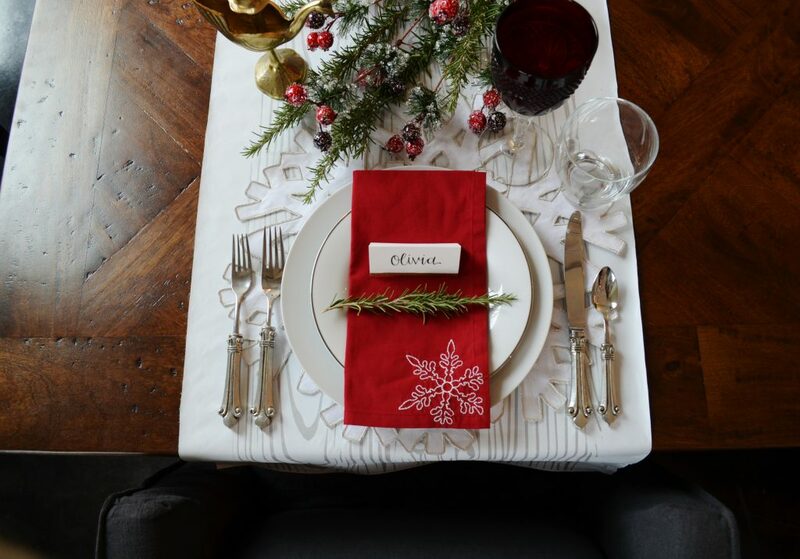 We hope our post inspires you to create your very own tablescape. For more holiday decorating inspiration, continue to read our blog, newsletter, and visit our Pinterest board. Happy decorating!